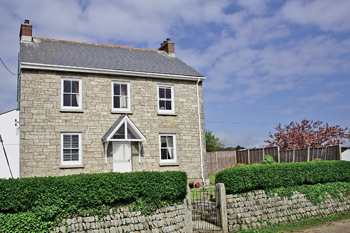 Just 10 minutes' walk from the beautiful sandy beach and boasting stunning views across Praa Sands to the Lizard peninsula beyond, the handsome farmhouse at Pentreath Farm was once a staging post for the London stagecoach and now offers two very comfortable apartments. Peaceful and quiet, this apartment retains original features in its recently converted interior and enjoys its own garden area, it sits beside the family run flower farm and an unobtrusive family camping field. The nearby beach sports a café and bar and fish and chip shop run by Chris Old of cricketing fame. Surfing lessons pick up from the farm and fishing trips can be arranged. Penzance, St Michael's Mount (N.T. ), Minack open air theatre and Tate gallery at St Ives are all a short drive. Pub and shop ½ mile. Two bedrooms. First floor apartment with spacious sitting room. Well equipped kitchen with dining area. Double bedroom with ensuite shower room/W.C. Twin bedded room. Bathroom/W.C.